I recently received an email talking about a forthcoming book about Egypt. I have no idea whether it's any good or who the author is, but it looks pretty scathing. It's called Inside Egypt: The Land of the Pharaohs on the Brink of a Revolution and seems to be a journalistic account, rather than an academic one, that captures the recent buzz on Egypt. But these books, while compelling to the readers, often miss out on deep trends and tend to exaggerate about things always being on the brink of collapse. But then again, many Egyptians believe that's case -- as the press reminds us daily. The author doesn't dwell too long on Egypt's storied past. Instead, he gives a blistering overview of what it's like to live today in this autocratic, hopelessly corrupt society. The Egypt he depicts is a place where anyone can be jailed or tortured at any time for no reason, where Islamic fundamentalism is slowly gaining a foothold among people formerly proud of their diverse heritage, where in some places the only viable form of employment for young men is prostitution, both gay and straight. 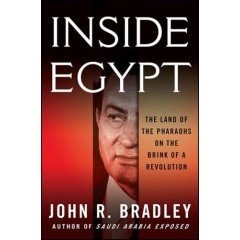 Bradley also examines why the United States spends $2 billion per year propping up President Hosni Mubarak ("the third-longest-ruling Egyptian leader in the past four thousand years"), despite his crackdowns on anything approaching democracy and his blatant favoring of anything that will bring in more tourist dollars over the best interests of the Egyptian populace. Mubarak is able to gin up American interest, the author notes, by playing up the threat of the Muslim Brotherhood, a nominally political organization that provides social services far more efficiently than the government does and wants to reinstate the Caliphate. Needless to say, Bradley isn't hopeful about the future, fearing that an Iranian-style theocracy is in the cards for a once-proud nation whose pedigree dates back more than 5,000 years. Unlikely to win the author any friends among the Egyptian political elite, but terrifically well told and extremely sobering. Update: I'm told that the author is a quite well-respected journalist -- am looking forward to reading this book.